When I told my daughters that Hotel Chocolat had offered to send me one of their Easter eggs to review but that I thought I’d have to turn it down because I was just too busy, you can imagine the look of devastating disappointment on their faces. Then it occurred to us, since many of their chocolate eggs are targeted at little ones, why not get the little ones to do the review? And that’s exactly what we did. When I was told by my mum that Hotel Chocolat had asked me to do a review, I was thrilled. It would mean tasting delicious chocolate. Yum!!! They sent us an Extra Thick Egg called ‘You Crack Me Up’ which we thought was a funny name. 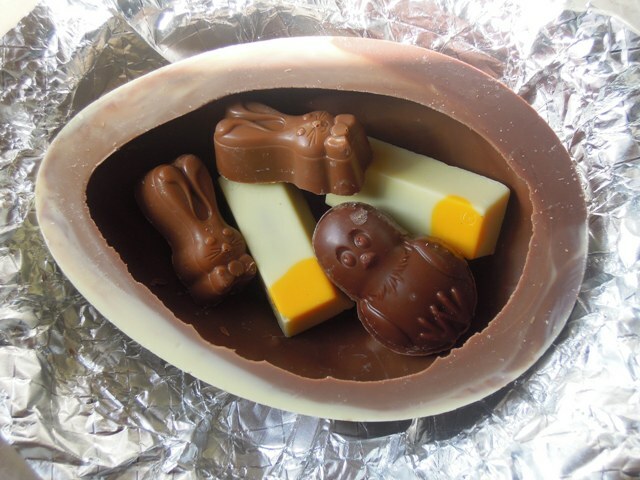 Inside the thick egg were lots of little chocolates in different shapes and sizes. The first thing I tried was a white soldier. Because there was two of everything, my sister had one too. It was delicious white chocolate on the outside with a mouth-watering scoop of chocolate like Nutella inside. It looked a bit like a piece of toast dipped into runny egg yolk. It was simply decorated but looked good. My rating:9/10. This is what my sister said: “It was really tasty and delicious and nice. I loved the taste of the yellow bit.” Mia’s rating: 7/10. The next thing I tried was the chocolate brownie. Although its name is chocolate brownie, to Mia and I it did not taste a bit like one. It looked amazing, but funny as well because of its sweet face. Also, it is amazingly smooth on the outside and filled with crunchy nut in the inside. This is my idea of a cute piece of chocolate. My rating: 7/10. This is what Mia said: “It was really crunchy and sweet, I loved the taste. It was really yummy and nice. I liked the look the best.” Mia’s rating: 9/10. The third thing I tried was an amazing looking chocolate chick. It looked spectacular, but turned out to be very rich. I loved the taste, but wouldn’t be able to eat too many! My rating: 7/10. Mia thought: “The chick looks fluffy and looks so tasty and yummy. It was so delicious.” Mia’s rating: 7/10. Next, we had a taste of the thick chocolate shell. I thought it was a gorgeously tasty smooth, hard shell. It tasted spectacular and was amazing. My rating: 10/10! This was my favourite bit! Mia said:“The shell looks so yummy and delicious. I love it. It’s so scrummy and yummy.” Mia’s rating: 10/10! Soon we came to eating the white chocolate fried egg. It was nearly as good as the shell. It looks amazing, tastes amazing, is amazing. My rating: 9/10. Mia said: “Looks very fried, looks very tasty, it is very good to eat. It is yummy!” Rating: 8/10. Now we were onto the chocolate rabbit. I loved it, especially the detailed decoration. Also it has a beautifully soft layer of chocolate. Yum, yum, yum!!! My rating: 8/10. My sister adored it even more than me (as much as the egg shell). “It looks yummy and it looks really tasty and is tasty,” Mia said. Rating: 10/10! Now we come to the final piece of chocolate. The crunchy praline – another cute, smiley face very similar to the chocolate brownie. It had a crispy outside and a spoonful of ‘Nutella’ inside. My rating: 9/10. Here is what Mia thought: “It looks really crunchy and nice. It looks so tasty I loved it. Rating: 11/10!!! As you can see, this was Mia’s overall favourite! 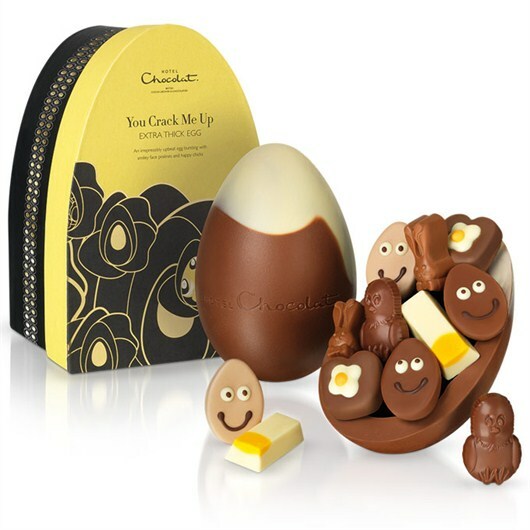 After tasting this spectacular chocolate, Mia and I are pleased to say we thoroughly recommend this as a posh Easter egg. Enjoy! At £28, you might think this is rather on the expensive side for a children’s Easter egg and I must admit I would certainly think twice about spending so much on chocolate. But a little goes a very long way with this egg. My children absolutely loved it (as you can tell from the frequent uses of spectacular and amazing in their review) but it has actually taken them a fortnight to get through it so I would say it represents good value for money. Since my girls were kind enough to let me try a tiny nibble, I can confirm that the chocolate is ruddy good too and so much more delicious and attractive than those cheap as chips eggs you can buy in bulk in supermarkets. 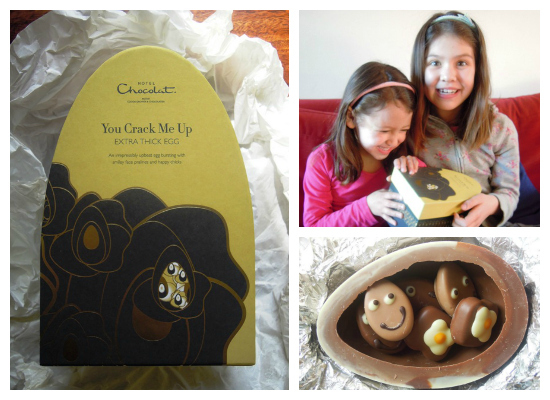 Disclosure: Hotel Chocolat provided me with a complimentary You Crack Me Up chocolate egg for review purposes. No money exchanged hands and all opinions are my own (or my daughters’). They can have their moments, believe me! Brilliant review! Will have to see if we can get one in Perth!!! I love HC eggs – they are expensive but taste worlds away from the supermarket offerings – your girls have a great palate – love how detailed they have been in their review, and so, so adorable! Well done girls!! Great reviewing! 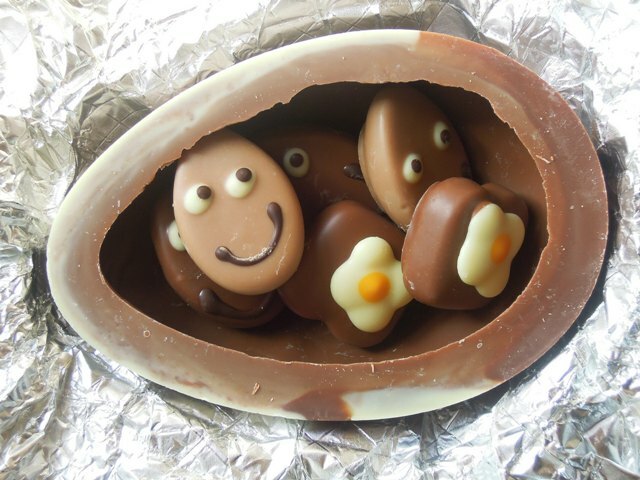 It is good to see you enjoy such delicious, quality chocolate…… Have a lovely Easter. What a fab way of reviewing!! Thanks Ren – yes it was very handy there was two of everything – made for much easier sharing! And a very happy Easter to you too! 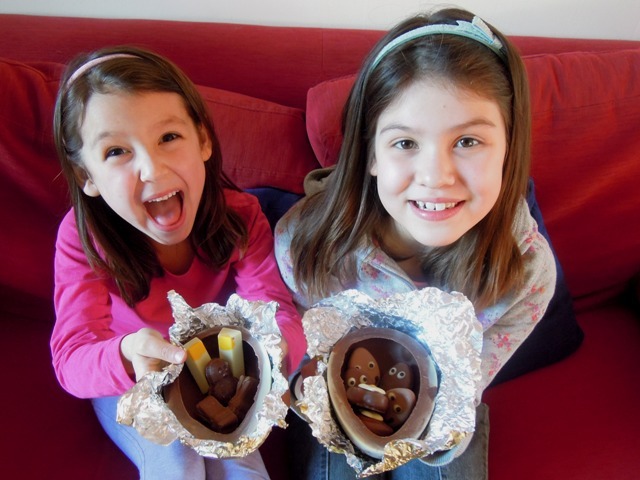 Thanks Lottie – what are Spanish Easter eggs like?